A game jam dedicated to gardening, puzzles, and the kindest talking tulip I know - Mr. Tulip Head. 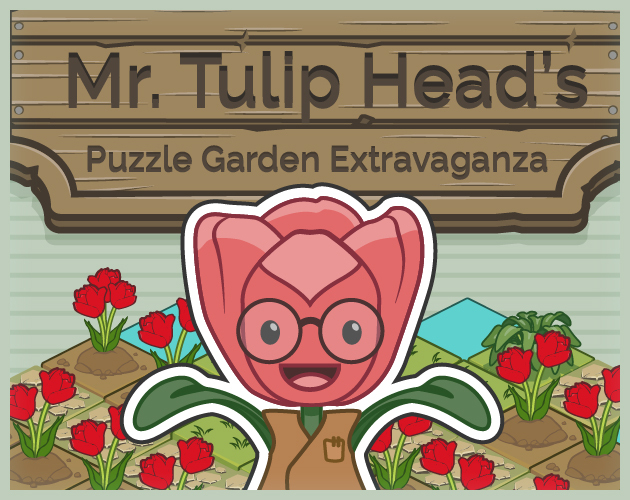 Grab a cup of coffee, sit down, and enjoy the harmonies of landscaping as you help Mr. Tulip Head design garden plots and solve puzzles focused on gradually working towards building a better garden. Gardening is not always as easy as it looks, it requires patience, perseverance, and a steady mind. But as Mr. Tulip Head always says "Zet hem op" - you can do this. Playing with a mouse over trackpad is recommended. All of the instructions are covered during the game, but in case Mr. Tulip Head is on coffee break and you need a refresher. Left Click - Place selected tile. Right Click - Pick up tile: tiles that can not be picked up are slightly lower and grayed out. Pathway: Must connect to each other. Must make a clear path from gate A to gate B without breaking. Tulip: The most charming plant, tulips score 1 charm for each adjacent path tile. Additional bulbs act as a multiplier for a tulip's charm score. Water: Must be placed near an already existing water tile. Water helps tulips grow: one bulb for each surrounding water tile. Tulips can grow up to three bulbs on a single tile. Statues: Not as narcissistic as they look. Cannot be placed near another statue and must be spread out. This is my third game for my jam-a-month project. It was meant to be a week long jam (ended up being 10 days) that at times felt more like a weak, long jam. This game is inspired by working with my father building and improving his garden. It is a lot of fun making small gradual improvements to something you care about and eventually looking back and seeing the big change at the end. I hope that translated into the design and you can enjoy that feeling with me. As always the project is developed in Unity and all graphics and code are made from scratch. Music is by John Leonard French - purchased under the "Ultimate Game Music Collection" from the Unity Asset Store. If you enjoy the game please reach out in the comments below. Additional Thanks to Jonathon Brown for his advisory role on improving and publishing this project to other popular web-portals. Since its initial development Mr. Tulip Head has been launched on ArmorGames, Kongregate, Newgrounds, CoolMathGames and CrazyGames: placing second-runner up in Kongregate's November 2018 contest and 2nd place in Crazy Games' 2018 developer contest. I got the chance to play this for my Indie Game Showcase last month. This game is very fun nd the puzzles are really great. I also love the wit of Mr. Tulip and if you try to speed pass his words, he calls you out on it. I thought that was a nice touch because you will have people play a game and rush through the words just to turn around and ask "How do I do that?" I thought think that it is excellent. Both an excellent puzzle game, and a very well polished one! Especially considering you tried to make it a restricted time limit. Small note, but sometimes I found that the tiles wouldn't switch even though I clicked on them and they appeared highighted. But I realize you made this game quickly so it's no big deal. I really thought this was a great puzzle and gardening themed game, very well done! I'm no designer, but I think there were lots of small details that made things look nice and play well, and also small things like a different "continue" dialogue from Mr Tulip was a nice touch! I look forward to seeing more games from you, keep up the good work! This is a really amazing, polished, and relaxing puzzle game. I love the artwork and the design of the game page, as well as the difficulty curve, teaching me all the basic mechanics of the game without a tutorial. Thank you for the positive feedback and kind words Riley. I'm glad you enjoyed the game! First of all, I just want to say Plot 16 haunted me for hours until I finally got a solution to it. Secondly, this was a wonderfully made game, I enjoyed a lot of it, though I do feel Plot 9 is a little too harsh of a difficulty spike. That's the only complaint I can really think of. The art style was charming, the mechanics were simple enough to grasp quickly but complex enough to provide some fairly tricky puzzles. The puns were good too, I love a good pun. Thank you for the kind words and specific feedback about difficulty Erirkain. Plot 9 was designed to be a hurdle to overcome, but it looks like it is doing its job too much too early - this will definitely be a plot to revisit in the future. Sorry for the haunting of 16, but I hope you enjoyed the satisfaction of an 'aha!' moment on finally finding the solution. Kudos on your perseverance!